Like all years do, 2016 comes to a close. At the end of every year everyone loves a good “best-of” list, like the 10 best recipes from Lucky Peach or the 10 best surfing vids from Surfing Magazine or the top 10 albums of 2016 according to NPR’s Tiny Desk. Instagram, however, is unique in that – in it’s squared format – it allows for users to post their top nine images with the hashtag #bestnine2016 to give others a quick recap of their year in photos. On what turned out to be one of our busiest days of the year, Santa took time from his busy schedule to “hang out” on the portaledge, and those who were brave enough climbed up to ole St. Nick to put in their order for presents. Even T-Rex got into the mix (more on him later). Outdoor retailers from all over the city were on hand and members got to participate in a gear swap. Great warm-up for the holidays! One of the hardest working climbers at First Ascent (Myung) shows of his apple bobbing skills. This was from the Uptown Hoedown community climbing comp. Fall was in full swing with staff dressed in ranching attire and competition was friendly and fierce. In our second community competition at the Uptown gym, Dan Bartz (FA founder) was in the right place at the right time to capture Adin get airborne. Conrad Anker (also more on him later) was on hand to witness the community that’s been growing ever since. Here’s the full recap. In the Fall, when “sending temps” were upon us, we wanted to see all of the FA community’s outdoor climbing pics. 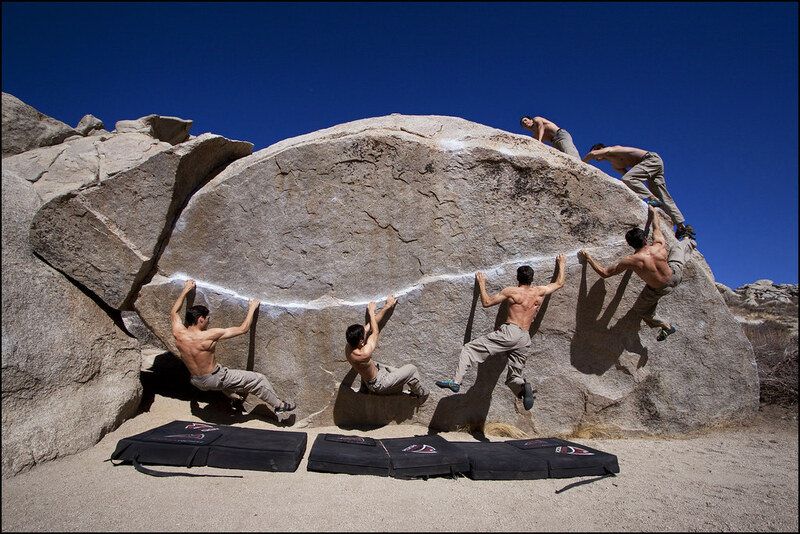 So we had a contest on Instagram using the hashtag #FAoutside for bouldering and sport climbing. FA Youth Climbing Team crusher, Estelle Park, submitted this winning image in the bouldering category, which won her some sweet bouldering swag. This is her topping out Plumbers Crack (V1/2) at Red Rock Canyon just outside Las Vegas, NV. Former FA member Ryan Thompson travels the world for work and pleasure. This iconic shot was taken during one of his excursions in Japan. Even when members move on, they continue to be FAmily! Until FA’s resident pro-climber Michaela Kiersch came along, no woman had completed Golden Ticket, a 5.14c rated sport climbing route in the Red River Gorge in Kentucky. Kiersch, with this and many other sends, continues to establish herself as one of the best climbers in the world. Photographer Andy Wickstrom was on hand to capture the send in still images and on video. Expect big things from this mighty lady in 2017 and beyond. When talking about Conrad Anker’s accomplishments, it’s hard not to sound hyperbolic. This man has summited the tallest peaks in the world and done death defying climbs on the most technical mountain faces nature has conjured. While in Chicago, he stopped by the Uptown Throwdown climbing comp in March, spent time with FAmily members and threw down, crushing some boulders. First Ascent Avondale turned 1 and everyone came out to the party, including T-rex. He tried and tried and tried to nail some dynos in the dyno-comp. Here’s one of his valiant attempts to score points. The video of this has over 300,000 views. Projected to open in Spring 2017, this bouldering-only gym will be the latest addition to the First Ascent family of climbing and fitness gyms. We are beyond excited to end the year with a new project like this, which will bring even more joy to the vertically minded Chicago climbing community. Thanks for Instagramming with us in 2016 and #letsclimbingchicago!!! A V1 boulder problem is NOT easy. It’s just not. When you walk into FA Uptown or FA Avondale and see climbers sending V1’s left and right, that seems normal because that’s what we expect to see at at the climbing gym. But it’s not something the average person can just walk up and do. A V1 can be compared to the most difficult movement in a 5.10c sport climbing route – a subjective but telling comparison. Think back to the time you first walked into a climbing gym. Were you able to climb a 5.10c with ease? I wasn’t! I have the privilege of talking to hundreds of climbers every week, and I’ve noticed a pattern in newer climbers. I’m talking about those who haven’t been climbing for more than two or three years. “I’m just not good at bouldering,” or “Anything beyond V2 is impossible for me,” or “I’ll never be as strong as those guys/gals,” or “This one problem looked cool, but I fell off after one try and moved on,” are all things I’ve heard more than once from those who fall into that 0-3 years range of climbing experience. FA founder Jon Shepard sporting his try-hard face. Bouldering is a great way to keep your ego in-check. Failure and bouldering go hand-in-hand. When climbing at your grade or trying to climb above it, most attempts find you peeling off the wall, seeing a foot slip, getting too compressed or overextended, and eventually falling to a pad below. Here’s the thing: failure when bouldering should not be discouraging! Why? Because failure is an inherent part of learning how to climb. Your body actually needs to fail in order to learn because of how your muscles create power in movement. To boulder well, a well-balanced marriage of technique, body awareness, and power is required (also, no T-rex arms!). Usually, better technique and a more acute understanding of where a body is in space comes with time and lots of practice. Power, however, can compensate in the time it takes to become a better all-around climber, and this muscular force can develop quickly if you give it a chance. When a muscle is engaged as a force is applied against it, the muscle must contract to generate enough power against that force. If the force is greater than the muscle’s ability to produce a counter-force under contraction, the object applying the force won’t move. In weightlifting, depending on how heavy a weight is and how many reps a lifter is doing, the lifter will eventually reach a point of failure – a point when s/he won’t be able to lift past a certain weight or a certain rep. Two things come into play when lifting a weight until failure: 1. Depletion of the energy source for the muscle (ATP) via anaerobic glycolysis and 2. Lack of Motor Unit recruitment. For a lifter to get stronger and do more weight or reps, s/he has to overload the muscle over time until the muscle learns to lift a heavier weight and the body makes adaptations to allow the muscle to use more ATP at heavier loads. This same process is at work when bouldering. Let’s say a climber is trying to make a move s/he has never made before; let’s also assume the muscle has sufficient ATP stores to allow for repeated attempts. The climber’s muscles must adapt to that movement through the recruitment of motor units that are activated by a motor neuron that needs to “learn” how to fire (turn on) when the movement is made. When a muscle begins to adapt to a movement, it starts recruiting more motor unit fibers until the contractile force is such that the move can successfully be made. That’s why when weightlifters go for their one-rep-max (the heaviest load they can lift once), they warm-up by performing that same lift with a progression of lighter-to-heavier weight. 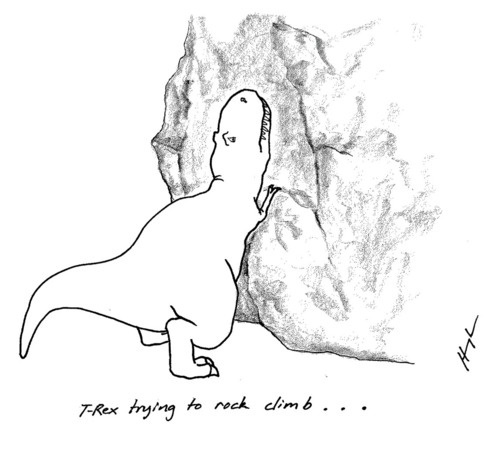 That’s also why measureable progress can be made between the start and finish of a boulder problem when a climber continues to work a problem – what climbers call “projecting”. Moves that seemed impossible at first become easier, sometimes in just a few short minutes. Give your muscles’ motor unit recruitment a chance. Don’t walk away from a V1 or 2 or 3 just because you fell off that first or second move. The vast majority of bouldering is failing, but each little failure is like a door that opens in a labyrinth. After many attempts, enough of these “doors” open and the path to the finish is clear. Remember that climbing – like life – is a journey, not a race. Be patient with bouldering. Take time to allow your body to catch up to what you believe you can accomplish. Also, work projects with other climbers to get encouragement and “beta” – technique pointers specific to the boulder problem you are working on. Failure is hard, but it is significantly softened when experienced in community. Rome was not built in a day, and those who climb V4-V17 boulder problems all started with V0 jug-hauls, too. The sweetness of giving yourself the time to fail, to one day send your goal grade or boulder problem, is priceless. For many, it’s what gets them hooked on climbing. And for any climber who sticks around long enough to see that progress, the tenacity and dedication developed while projecting boulders in the gym can be taken along for the challenging but rewarding journey we call life. PS full disclosure: I have yet to send an outdoor V4… I’m a move away from these four: 1. 2. 3. 4. I know all y’all’s pain! This blog by FAmily member Mila Ugryn talks about climbing with friends and with guides. Both are valuable assets in a climber’s life. Mila can be found, mostly at FA Avondale, several nights a week sport climbing with friends, and dipping her toes into bouldering. Like so many of us, she’s eagerly gaining knowledge to climb safely, and in the meantime that means hiring guides so she can enjoy climbing outdoors, learn and be safe at the same time. My first climbing experience was outdoors with friends Zoran and Sasha at Devil’s Lake in Wisconsin. Several years ago a big group of friends came out for hiking and camping, and most of us had zero climbing experience. For me, Zoran and Sasha opened Pandora’s Box to climbing by inviting each one of us to do a route or two. They were welcoming, kind and patient; lending their shoes, teaching about safety and belaying for hours before climbing themselves. Rock climbing didn’t seem as intimidating anymore, when it was two friends teaching us and welcoming us with open arms into the sport. After that first climb, I was hooked. Back then, however, I didn’t know how committed I could become with only outdoor climbing opportunities available. First Ascent opened a year or two after, which solved the problem of having a consistent place to climb in the city and I was sucked into the climbing community and its culture. This year our generous boss at Italian Expo gave us a few days off for Thanksgiving, which meant an opportunity to take a trip and stuff ourselves with turkey in a new place. We chose Boulder, which was the most affordable and interesting place to us, and my heart was overcome with joy when I thought about all the climbing opportunities in Colorado. The night before, we booked our flight, an Airbnb, car and a climbing guide since we didn’t know anyone in Boulder who could take us. Boulder is a special place, home to some of the most famous climbing stars of United States, and according to some one of the most athletic cities in US. With so many people climbing and doing outdoor activities, competition from climbing companies to get business is intense. After calling several places (the day before Thanksgiving) and trying to book a guide, Jeremiah of Colorado Climbing called back and agreed to take us climbing. One of the other companies returned my call later, and inquired about who we’d hired. They didn’t recognize Jeremiah’s company, and mentioned they’ve been in the industry for over 40 years, suggesting perhaps, that their company is more experienced. Their approach made it clear that during the off season every client counts, but it made it for an awkward conversation since I wasn’t about to break my promise to Colorado Climbing. We were all set for Saturday, and I couldn’t have been more excited. My guide Bob offered to do some rappelling, trad, multi-pitch climbing and anything else my heart desired. Having taken the Gym to Crag classes with Sandy Morris at First Ascent, which teach rappelling made me feel more comfortable when attempting it for the first time outdoors. In my opinion and with my experience level, going climbing with a guide in a place where you don’t have rock climbing friends is a must. With this being said, hiring Bob wasn’t the first time I used a guide to climb. While living for a couple of months in Rio de Janeiro last year, without any gear or shoes, I hired a guide who took me on a wonderful climb with a beautiful view of Urca. While my broken Portuguese at the time may have helped me make rock climbing friends who may have taken me for free, I have to say, both experiences with a guide have been very educating. Guides know the routes, how to keep people safe and intimate knowledge of the rock. This eliminates anxiety and takes away hours of research. Bob took us up a couple of routes at the East Slab and a few at East of the Sun; the hardest route we climbed was a 5.9. Bob genuinely encouraged me at the crux of each route, taught about trad and multi pitch climbing in between pitches, rappelled me from the last route and encouraged supporting and joining the Access Fund. To top it all off we had scenic view of Boulder through the entire experience.